Whether you are a musician, producer, or podcaster on a tight budget, the AudioBox USB 96 is for you! This simple, handy little recording interface has just the right features for basic recording needs, allowing you to plug in and start recording up to 24-bit, 96 kHz audio right away. 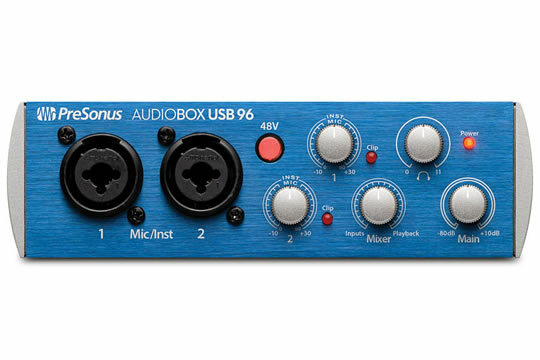 Bus-powered and built to travel, the AudioBox USB 96 makes recording easy. The two front-panel combo mic/instrument inputs make it ideal for singer/songwriters, podcasters, and guitar or guitar-bass collaborations. Simply connect a couple of mics and you have an easy-to-use stereo recording system. A mix control lets you control the level between the input signal and computer playback, without hearing annoying delays. You also get a pair of balanced line-level outputs, an ultra-loud, crystal-clear headphone out, plus MIDI I/O, so you can connect your favorite synth or MIDI controller. The result is a simple, affordable, mobile recording solution.